Jones The Bootmaker - Home shopping catalogue online! Welcome to the Jones The Bootmaker online shopping catalogue page at STAMP DEMON. Please read their text below. "Jones is the story of family business, which began in 1857 when Alfred Jones and his wife Emma opened their first footwear shop in London's Bayswater. Conditions were much harder than today with opening hours from 8am to 8pm, except on Saturday when the shop was open until midnight. 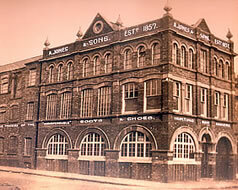 Jones Bootmaker shops are the latest chapter in Jones distinguished history. In 1994 the first new generation 'CityBootmaker' shop was opened in Kings Street, Manchester. The winning formula has continued throughout the years with stores opening in Bluewater, Trafford Park and in Touchwood, Solihull. Jones Bootmaker has established an enviable reputation as one of the foremost fashion leaders in the UK Footwear Industry. With up to the minute fashion styling to compliment the new season's clothes the ladies range include elegant shoes with hint's of 1920's and 1930's movie glamour. The men's range features two-tone brogues and wonderful coloured moccasin slip-ons. Formal footwear makes a bold statement for the customer who looks for quality as well as superb styling. The whole Jones Bootmaker collection encompasses quality and style with excellent value for money". CLICK HERE TO VISIT THE JONES THE BOOTMAKER WEBSITE!